If ever there was a hi-fi product that drew an invisible line under the nineteen seventies, as if to say, ‘this chapter is now closed’, it was Celestion’s SL6 standmounting loudspeaker. 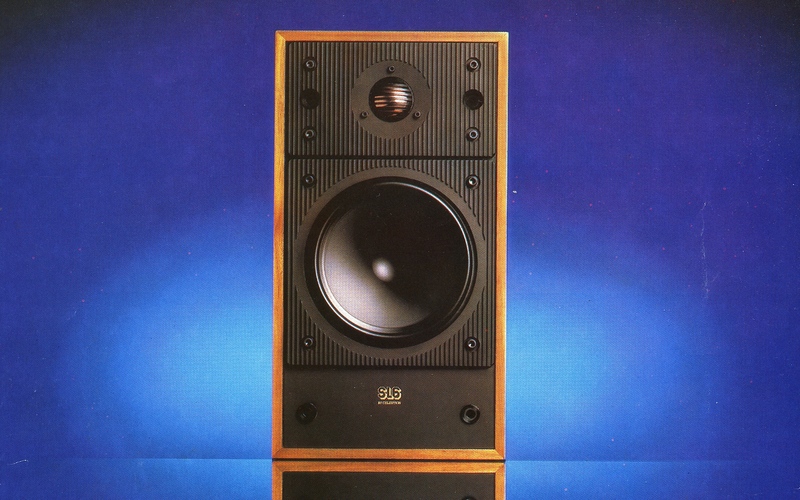 It’s hard to describe just how modern it seemed at the time of its launch in September 1981; so striking was its design that it became shorthand for everything that modern loudspeakers were. Nothing really looked or sounded the same again, because it just couldn’t. Let’s not forget that your average nineteen seventies loudspeaker was a million miles from the sort of things we can buy today. Many were large, underdamped and not-terribly-rigid boxes, some of which even sat on the floor (yes, really), or at best, had swivel stands with castors to make them easy to wheel from behind the sofa. They would usually have a profusion of drive units, and were often three-ways with the odd supertweeter thrown for good measure. Factor in a vast footprint and a wide front baffle, and that was your generic transducer from the decade that fashion forgot! That’s why the SL6 was so special. First it was small, second it was a two-way. Third it had a metal dome tweeter (the first British box to use one), and fourth it had a fancy mid/bass driver that had benefitted from laser interferometry to optimise it for linearity and low distortion. Celestion hadn’t just opened up the RadioSpares catalogue and ordered something decent in; rather the company had taken real trouble to custom design a drive unit capable of doing a particular job. With a Kobex cone and a concave centre with no dustcap, it sure looked different. Also, at just 165mm it was tiny – even your average budget Wharfedale box had a 200mm diameter bass cone in those days. The SL6’s all-new 32mm metal dome tweeter was a sensation. It was made from copper because it dissipated heat well, although you’d never call this the lightest metal around – meaning the dome was electroformed to a miniscule 32 micron width to keep weight down. This caused problems, pushing its resonant frequency very close above the audio band, so the crossover actually had a notch filter to contain this. The 12 litre cabinet was made from 19mm particle board, very strongly braced and damped in a fashion that was far from the norm back then, but – unusually by today’s standards – was an infinite baffle design. This, along with the small size, made for the most inefficient loudspeaker of the decade – you needed at least 50W of solid-state power to get so much as a squeak! Celestion promoted the SL6 by making a big song and dance about the lasers and computers used to model the speaker’s behaviour. At the time it seemed remarkably futuristic, almost as if you were buying your own personal stake in tomorrow. As you’d expect, the speaker did sound rather different to much that had gone before. Treble was smooth but crisp and detailed, bass was taut and tight (albeit a little over damped), and the midband was well carried with good clarity and projection. Compared to the booming cacophony of umpteen mismatched drive units in older speakers, the SL6 sounded lean and mean and lithe, so was especially well suited to classical programme material. With rock music, the ‘6 was rather over-polite. It was not a loudspeaker able to really play with the frequency extremes and have fun – it seemed a little out of its comfort zone delivering really deep bass, and what low frequencies it did have weren’t the most ebullient. Up top it lost a little sparkle, although it was fast and sonorous from the upper mid to the lower treble. Also, the absence of cabinet colourations gave it something of lack of character. In truth, the SL6 was something of a ‘dead’ sounding design, in a good way and a bad way. A fascinating loudspeaker from a time long gone, Celestion’s SL6 was truly a taste of things to come. It sold very well, and spawned several variants such as the SL6S and the SL600, all of which offered a very mature, composed, refined sound – a sort of boxed, moving coil version of a Quad electrostatic, if you like. It even spawned a subwoofer package, the System 6000. Nowadays, a good pair will set you back £300 or so, with all the usual caveats about trying before you buy. This unique loudspeaker put metal dome tweeters on the map in the UK, and introduced the idea of narrow baffles too. Somehow, in some small ways, the hi-fi world would never be quite the same again – and nineteen eighties loudspeakers never looked back. Luv’em! Bought 9 pairs! Gotta have backups just incase. John Atkinson, the only man to have edited both Hifi News in the UK, and Stereophile in the US, sold off his vast personal hifi collection when he emigrated to the US, except for two items – the original Krell 50 Class A power amp, and a pair of Celestial SL6’s. I keep mine for their relaxed spaciousness and the beauty with which they reproduce violins.